This week I wrapped up finish on my block-front chest then installed the hardware. 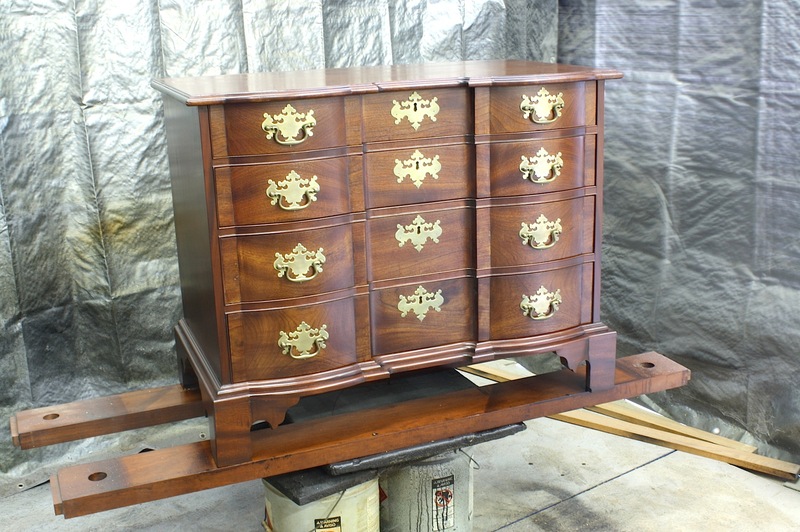 While hardware installation on this chest is a bit different due to the rounded block-front design, once the location of the plate is decided all else is identical. For those of you who wonder how I go about this step, here it is. Ordinarily, I would measure in from the drawer ends to locate my back-plate. That is a bit difficult when dealing with block-front drawer fronts. Because I wanted each plate centered in the rounded section and had to find that point, I cut a thin strip to the exact length of the curved portion then marked its center point. 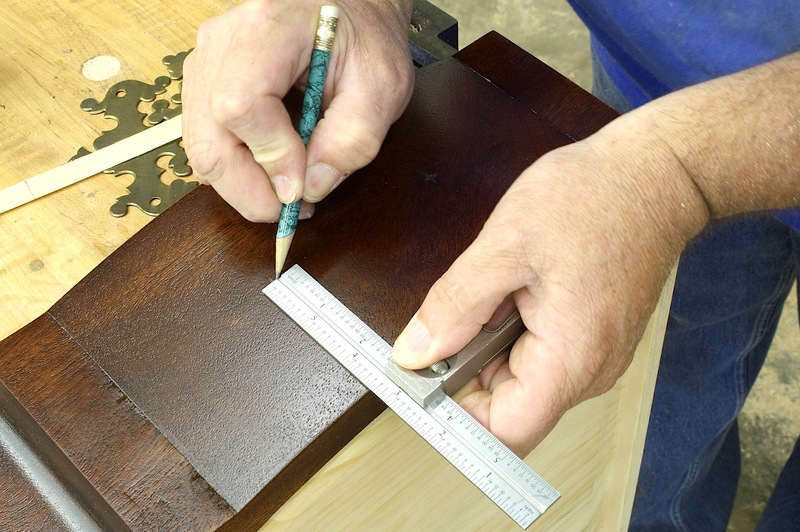 Lay the strip on the drawer front, position the lower point of the back-plate just at the center line of the strip then mark both hole locations. I strike a vertical line at the center of each hole. This hardware also requires that the holes be centered from top to bottom. 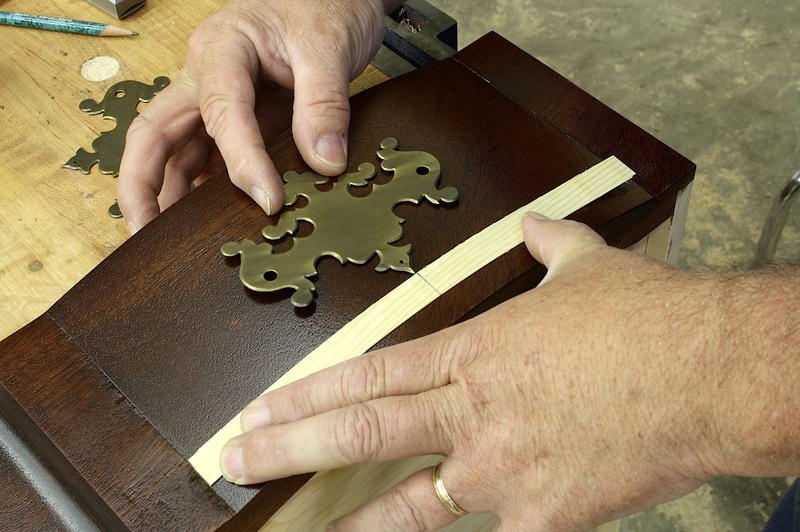 This is easy when using a double saddle square. With my square set, I struck a small line to form a cross-hair that indicates exactly where to drill. At my drill press, I installed a 1/16″ bit then drilled a pilot hole through the drawer front. 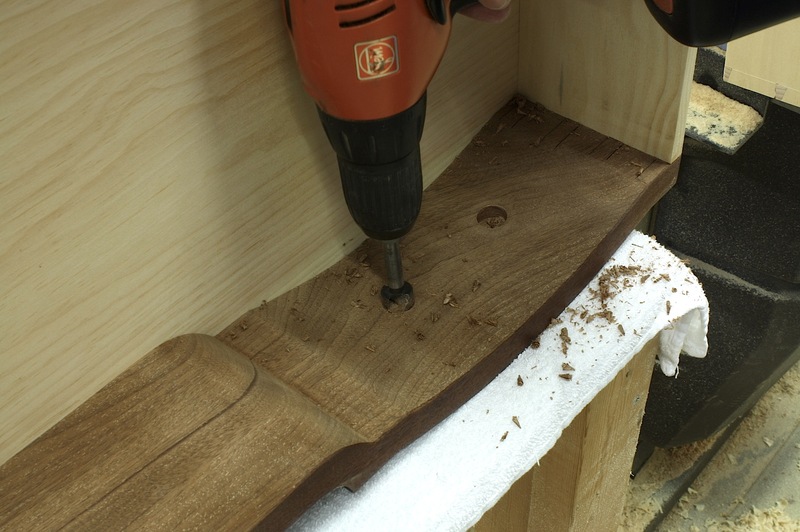 With the drawer set so I could operate on the interior and using the pilot hole as a guide, I drill a 5/8″ recess which is just large enough to allow socket access for tightening the nuts. This recess allows me to keep any posts and nuts flush on the inside of the drawer. You do not want to catch your unmentionables on your hardware. 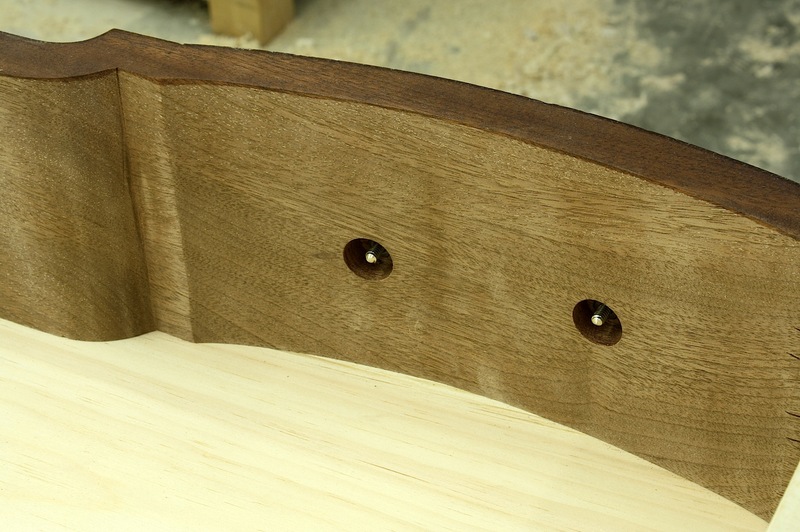 With the drawer flipped down so I can work on its front, I complete the hole using a bit that matches my post diameter. The pilot worked to keep the two drill operations aligned and straight. On most of the drawers I work on, the posts need to be cut in length to remain in the recess cut in the back face of the drawer front. I figure the thread length needed, grab a piece of scrap that is the correct thickness then cut each post to size. 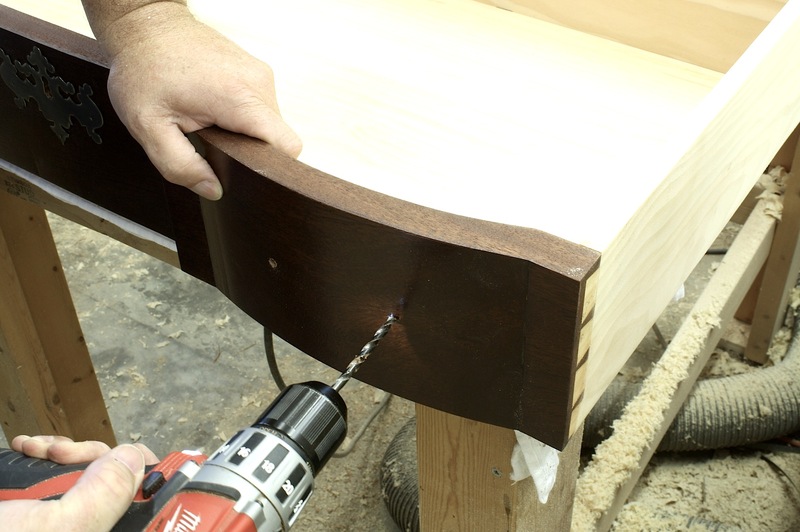 The post ends are not conducive to easy nut installation straight from the saw, so I use a sander to round the ends as shown in the photo above – when you have fat fingers working in small recesses, you want every advantage you can get. Although it is not easy to see the nuts in this photo, this is the look inside each drawer. Posts do not extend into the storage area. This presents a clean look inside the drawers. As for the outside, the photo below says it all.